U.S. Secretary of State Rex Tillerson meets with Republic of Korea Foreign Minister Kang Kyung-wha, and Japanese Foreign Minister Taro Kono at the Sofitel Philippine Plaza Manila on August 7, 2017. Trans-Pacific View author Mercy Kuo regularly engages subject-matter experts, policy practitioners, and strategic thinkers across the globe for their diverse insights into U.S. Asia policy. This conversation with Dr. Paul Heer – Adjunct Professor at The George Washington University; former National Intelligence Officer for East Asia at the National Intelligence Council; and former Robert E. Wilhelm Fellow (2015-16) at the Massachusetts Institute of Technology (MIT) Center for International Studies — is the 105th in “The Trans-Pacific Views Insight Series.” The views expressed in this article are solely those of Dr. Heer. How do countries in East Asia view U.S. leadership as a Pacific power? Over the past few years most countries in the region — including and especially U.S. allies and partners — have become increasingly skeptical about the future of U.S. leadership in the western Pacific because of Washington’s distraction with problems elsewhere on the globe, budgetary constraints in the wake of sequestration, and partisan political gridlock. They don’t question U.S. commitment to the region, but they have growing doubts about U.S. readiness and ability to uphold it. And this uncertainty has led many of them to start recalibrating their foreign and security policies to make them less reliant on the presumption of strong and sustained U.S. attention to the region. They are starting to think and plan beyond the role the U.S. has played there since World War II. What impact has the Trump administration had on regional views of the U.S.? The trends discussed above have been unfolding for much of the last decade, but the withdrawal from the Trans-Pacific Partnership was a huge benchmark in terms of reinforcing regional doubts about Washington’s readiness to stay engaged and to actually exercise leadership in East Asia. 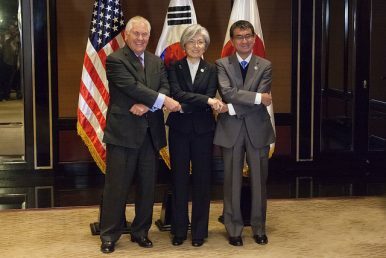 Many governments in the region, such as Tokyo and Hanoi, made hard domestic policy choices in order to sign on to TPP because they saw it as a key vehicle for ensuring broad and deep U.S. economic engagement in the region — which they want in part to counterbalance their fear of Chinese economic dominance. The U.S. withdrawal from TPP pulled the rug out from under that hope. And Trump’s statements about the need for U.S. allies in the region to contribute more to their own defense — even though his administration has retreated on this somewhat — have only reinforced doubts about Washington’s commitment to their interests. How has this affected China’s role and strategy in the region? China has been actively seeking to extend and deepen its own influence in the region, partly in response to what it perceives as U.S. efforts to prevent that from happening. So the Chinese are more than willing to capitalize on their neighbors’ doubts about the staying power of the United States. To that end, they are doing what they can to feed those doubts, and to encourage other countries in the region to recalibrate toward “mutually beneficial” relationships with China. Beijing’s establishment of the Asian Infrastructure Investment Bank and promotion of its “Belt and Road Initiative” are key elements of China’s strategy for filling the gap in regional leadership left by the United States. Where does the North Korea issue fit into this equation? The North Korea problem reflects the complicated diplomatic fault-lines and range of views about the role of the U.S. in the region. All the countries in the neighborhood seek U.S. leadership in dealing with Pyongyang, but they have varying levels of confidence in — or comfort with — the approach Washington has been taking. This was only reinforced by the recent escalation of rhetoric between Kim Jong-un and Trump. For its part, China welcomes a U.S. leadership role but believes the only lasting solution to the problem requires a U.S. security guarantee to the North — basically, that Washington should renew an offer of carrots rather than focus only on applying sticks. South Korea and Japan also want U.S. leadership in dealing with the North, but they actually share some of Beijing’s concern about U.S. sticks: they are nervous about the possibility of Washington resorting to military action because they are most vulnerable to any potential North Korean retaliation. This reinforces their uncertainty (mentioned above) about U.S. attention to their interests and security. What can Washington do to address these trends? The United States faces the dual challenge of reaffirming — persuasively — the substance and steadfastness of its security commitments in East Asia, while reassuring allies and partners that Washington will exercise its role in the region in a way that is measured and attentive to their interests (rather than impulsive or potentially escalatory). In walking this line, Washington frankly needs to recognize — whatever level of resources and resolve it can bring to bear in the region — that its traditional role in East Asia since World War II is becoming historically obsolete because of tectonic shifts in the economic and military balance of power. American “primacy” in the region is probably neither recoverable nor sustainable. But the United States can remain a powerful and influential leader in East Asia if it gets its domestic house in order, updates its strategic goals in the region, and matches those goals more closely with its resources and capabilities. Revival of TPP would be a good start. And success in dealing with both Beijing and Pyongyang will require a more accurate understanding of the strategic drivers of their behavior, as opposed to simple reliance on the logic of force. The political landscape in the United States suggests the Obama administration won't oversee TPP ratification.